Recently I was asked the following question, "What's the most important part of the relationship between a FOH engineer and the worship leader?" There are a number of aspects to that—and any—relationship, many of which are very important. It's great if the worship leader and sound tech are great friends and hang out all the time; but it's not necessary. It's certainly easier if both enjoy the same styles of music. If both share a lot of common interests it's easier to establish communication metaphors to explain what they're talking about, but again, it's not necessary. No, I'd have to say the most important aspect is trust. Both have to believe they're on the same team and are going for the same result. When trust is established and solid, each understands they have the other's back. Neither has to operate from a position of fear, and both are free to speak into the other's role because the point is to make it better. Trust is a wonderful thing. Trust can take a while to earn and establish however, and it takes some work. I think that's why so often it does't exist in those engineer / worship leader relationships. To build trust, you need to spend time with each other. You need to talk through the goals of the ministry and learn about the other person. You need to be willing to be vulnerable and put down any pre-concieved notions about the other person. That's not always easy. Sometimes trust is built on the battlefield. I've been in situations where there was no trust between the worship leader and the tech booth. It was a battle each Sunday to pull off a service. Over time, with the application of steady determination to provide quality tech support, trust was established. 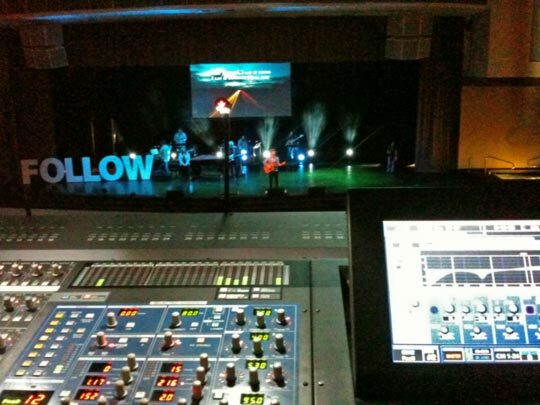 The worship leader began to back down and trust the tech team. As that happened, the tech team began to respect and trust the worship leader. It took about four months (and included at least one weekend where I almost walked out saying, "Mix it yourselves! "), and was a lot of work. In the end, it was worth it. When the relationship is built on trust, it's a wonderful thing. When it's not, everyone knows it and feels uncomfortable. There are a lot of churches that want to upgrade equipment, get better musicians, maybe even replace the worship leader or sound guy when instead what they really need to do is build trust between those two. I'm blessed to be in a situation right now where both our worship leader and I trust each other quite well. Because of that trust, we work together very smoothly and each of us is ready to defer to the other at almost any point. It's not that we don't have strong opinions about our fields, it's that we know we're going for the same result, and we're willing to do whatever it takes to get there. I can't tell you how much easier that makes the weekend.